Another defeat for Aberdeen at home against Heart of Midlothian in front of a measly crowd of just over 8,000 supporters consigned Mark McGhee’s men to their third consecutive defeat, yesterday. Dark days indeed at Pittodrie, but just how bad are Aberdeen at the moment? There is an argument that there have been worse teams at the club in the past, particularly regarding the clubs position in the league. A 12th place finish in 1999/2000 under Ebbe Skovdahl, should have seen Aberdeen relegated but a restructure in the SPL to add it from ten to twelve teams saved the club. Despite the woeful league finish, the team still had some key talent (Eoin Jess, Avrum Stavrum, Zerochli) and also quite unbelievably reached two domestic cup finals, a feat that has completed eluded Aberdeen since. The 11th place finish back in 2004 under the helm of Steve Paterson was also poor an could probably be compared in squad terms to now, but the Aberdeen fans have always had high expectations, and with the magic from the supposed messiah of McGhee failing to deliver, why is the club failing to meet the expectations of its supporters? Firstly, this is partly on past success. As a club Aberdeen live excessively in the past especially on the club winning the Cup Winners Cup in 1983. Aberdeen also defeated the mighty Real Madrid in the Super Cup, the same year, and this was a team managed by none other Sir Alex Ferguson. Try topping that, but even in the last twenty years, Aberdeen have been a force. The early 90’s team came close to breaking the Rangers team of nine in a row in an era, which also included Celtic’s worst ever team. The club almost won the league in 1991, but lost on the last day at Ibrox. Two years later, the team also managed to reach two cup finals but lost both to Rangers. The squad was talented consisting of Scottish internationals, Stewart McKimmie and Alex McLeish plus young prodigies, Eoin Jess and Scott Booth as well as talented Dutch internationals, Hans Gillhaus and goalkeeper, Theo Snelders. How, Aberdeen would kill to have a squad like that right now but the club have no funds. A lack of money has plagued the game in Scotland, but for a club of it’s size, it is hard to judge Mark McGhee when he has struggled to bring in new players because of the lack of funds. However both his signings, Stuart Nelson and Jered Ifill, have both been dire. The latter in particular, signed from Swindon Town in English League One is one of those players that is just not good enough for this level. Say what you like about the Scottish Premier being on a par with League One, but the irony is that Ifill has looked woeful on his part, when asked to play at a higher level. There are also players that don’t kill for the shirt. Gary McDonald and captain, Mark Kerr, both decent players at their other respective clubs in the same league, have been the subject of much abuse from the supporters because of their supposed lack of commitment, and passion. 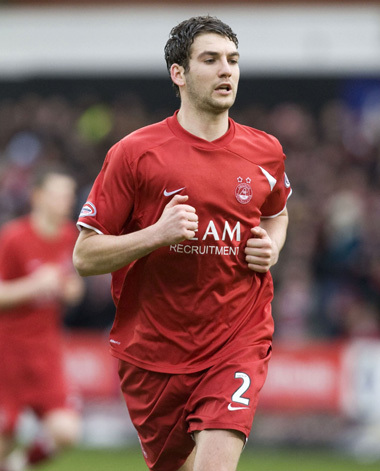 The supporters would love another Russell Anderson, Willie Miller or even Brian Grant. Yes it is true that Aberdeen have been down this path before, but this woeful record by this stage of the season, is still bad for this once proud club. Getting knocked out of two first division teams in a season is almost unacceptable, rather than unlucky. The club should always be looking to do well in the cup competitions. However recent failures have come against Queens Park, Dunfermline, Dundee, Raith Rovers and most notably Queen of the South back in the Semi finals of the 2007-2008 Scottish Cup. All teams were lower league teams but Aberdeen’s failure to knock out the Doorhammers in a game in which they were huge favourites, was a huge morale blow for everyone associated with the club. So what can McGhee do? It will be hard to rebuild the squad at present. He needs to just keep the club in the league and then focus in the summer. There are some decent players, Langfield and Mulgrew plus Zander Diamond but there are also several young players like Michael Paton, Fraser Fyvie and Peter Pawlett. The option now is to blood more youngsters once league status is secure and focus on freeing up wages. A signing like Chris Porter which McGhee made when in charge of Motherwell would be good for a club which is particularly relying on goals. Also trying to continue to bring more young players through is extremely important. This would be better than bringing in journeymen like Duff and Grassi. In addition, the club has already benefited from youth particularly on the stance of 16 year old, Fraser Fyvie. There will be good times round the corner, but just wait a while. It’s never easy being a fan of Aberdeen but also never boring.